Beading Arts: Do you name your jewelry pieces? You know that I don't mean naming them things like "necklace", "ring", "bracelet", etc! I have been an advocate of naming your pieces for a long time, although I'm not very good at it and often have to turn to readers for help at the crucial moment. Whether or not you are name-challenged like I am, I will appeal to you once more to consider coming up with names for your creations, because now I have proof that it makes a difference! If my argument that it gives honor and value to your piece to give it a name has not convinced you, perhaps the argument of a better writer will! Along with that, I'm adding a bonus: a collection of articles that will help you write better descriptions of your pieces, which may in turn help you to figure out a name for them! Cyndi, thank you for both of those articles. 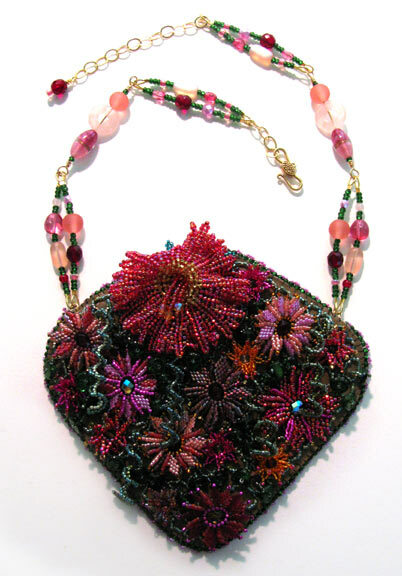 I did notice on the Bead Soup Blog Party that a lot of designers titled their pieces. Cyndi, Thanks I'll be checking out those articles. Most of my pieces I do name, but not all. Sometimes it just doesn't come to me. But a lot of times, it just feels like it needs to be named. Then I feel silly for doing that. I name most of my pieces, although as a person with limited time (full time job gets in the way, sometimes I make a piece and do not name it until much later. Many pieces cell without names. The one I'm making now will definitely be named, and I always help out when others want names for their pieces. Yes, I do name them....but sometimes the name doesn't come to me right away. With some pieces , it's easy. I like to refer to them by name rather than "the necklace I used the fiber and seed beads to accent the focal...." or something like that.